EVANSTON, Ill. — If you combine two or three metals together, you will get an alloy that usually looks and acts like a metal, with its atoms arranged in rigid geometric patterns. Now a group led by scientists at the Department of Energy's SLAC National Accelerator Laboratory, the National Institute of Standards and Technology (NIST) and Northwestern University has reported a shortcut for discovering and improving metallic glass — and, by extension, other elusive materials — at a fraction of the time and cost. The research group took advantage of a system at SLAC's Stanford Synchrotron Radiation Lightsource (SSRL) that combines machine learning — a form of artificial intelligence where computer algorithms glean knowledge from enormous amounts of data — with experiments that quickly make and screen hundreds of sample materials at a time. This allowed the team to discover three new blends of ingredients that form metallic glass, and to do it 200 times faster than it could be done before. The study was published today, April 13, in Science Advances. 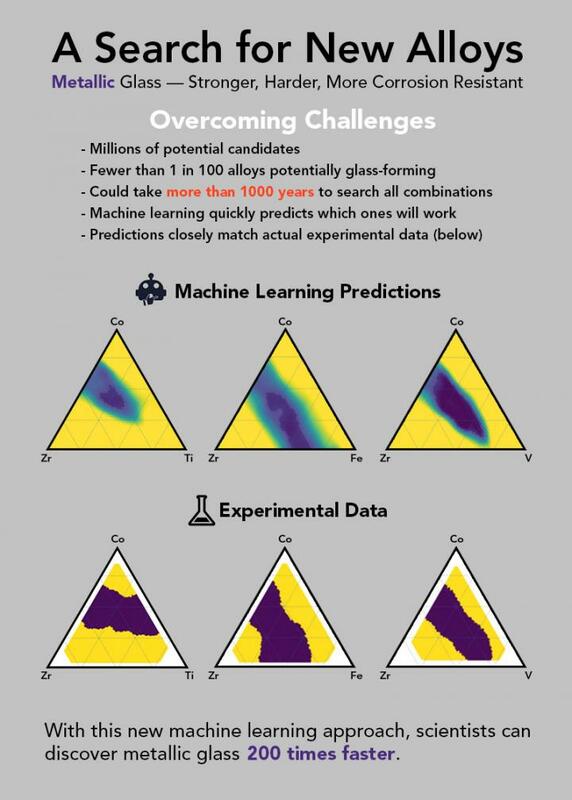 The ultimate goal, said Wolverton, who led the paper's machine learning work, is to get to the point where a scientist can scan hundreds of sample materials, get almost immediate feedback from machine learning models and have another set of samples ready to test the next day — or even within the hour. The study was funded by the US Department of Energy (award number FWP-100250), the Center for Hierarchical Materials Design and the National Institute of Standards and Technology (award number 70NANB14H012).